PROGRAM Realty offers simply the highest level of service available to both buyers and sellers of Southwest Florida real estate. No matter if you are looking for a beach house on Boca Grande, a golf course view condo in Venice, or a new home in Englewood, we are here to help. 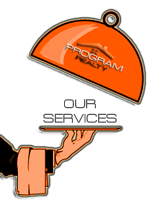 We handle all types of Florida real estate transactions with honesty, integrity and loyalty. This website shows real estate listings from every brokerage in the area, not just our own. At any given time there are 100,000 plus listings available via our MLS system. These listings include regular sales, bank owned foreclosures and short sales. When you search via our website you can rest assured that there is no stone left unturned. When we represent our buyer clients we typically do so as a single agent or “buyer’s agent”. What this means is that we are looking out for your best interests and do not have an agenda to sell you one specific property like a listing agent would. Unless you are a real estate expert with formal education in the Florida real estate market you should never go directly to a listing agent for information or to buy. Use one of our experienced agents to navigate the possible pitfalls of your real estate transaction and remember our service is always completely free to buyers. No we don’t charge transaction fees like many of our competitors…be careful it’s a jungle out there!